Nintendo, I think I finally understand Mario. I’ve been watching my nephew play Super Mario Maker for hours on end over the course of two days. A late delivery on Friday afternoon had his nerves in a bundle. He tried to temper his disappointment and excitement by distracting himself with whatever slim pickings of downloaded games I have on the Wii U. When he finally received the game, the system update needed to play it nearly destroyed him. For two weeks prior, the words “Super Mario Maker…” were frequent dialogue starters, and the focus of most of his conversations. And for two weeks, there was little interest on my part. A 30 year anniversary for Mario is a huge deal, but I acknowledged its existence with a matter-of-fact, tepid attitude. The early side-scrolling platformers which made the red-clad plumber an icon, are not ones I hold any particular attachments to. That’s not to say I don’t think they’re fun or brilliant. Rather, I’m terrible at Mario 2D platformers. As far as games go, they’re my white whales. How many World-1s have I left Mario at? Nearly all of them. Every so often I’ll revisit Mario, hoping my skills with age and newly-acquired knowledge will be enough to defeat Bowser—they never are. The 2D Mario games leave me with a lot of frustrated determination. The kind I never seem to conquer, no matter how hard I try. My latest obsession has become Super Mario Bros Wii U’s Iggy, past the lava waves, in his castle deep in Soda Jungle. To feel better about my failings, and privy to one of gaming’s most beloved series, I spent much of my time mastering Mario’s 3D incredible adventures on the 64, under the Sunshine, through the Galaxies, on Land and all over the World. There’s also my love of Mario & Luigi’s RPG series. I found my comfort zone in Mario’s universe with all of those games, and it’s why Super Mario Maker was just another 2D game celebrating a 30th Anniversary—an important event I intended to experience on a sale. As it turns out, 9-year old nephews with birthdays in the middle of the Autumn release schedule are a blessing. However, 9-year old nephews whose interests are leaning more and more towards playing online multiplayer games with their friends are risky things. Luckily, my nephew is not quite at that stage where he solely wants to do his own thing which excludes “cutesy” games, or his family (and he’ll hopefully never be). But there’s something to be said about Nintendo’s appeal that can reach any age. He also loves building things and Super Mario Maker is exactly what he wants. I’m thankful for that because the game’s been a blast. Super Mario Maker truly is a love letter from Nintendo to its legacy, and to its fans. It’s every single insane idea multiplied by infinity. It delves into the creative minds that gave memories to gamers the world over these past 30 years. Giving fans the tools to well-guarded imaginations in the franchise, then seeing them expand their own ideas has been an absolute delight to witness and play. Unlocking costumes of Nintendo’s well-known series throughout their gaming history are fantastic little nuggets of joy. Discovering hidden secrets and nods to my own Nintendo memories past have been surprising. I’m a fan of Nintendo but mostly of a few select series, namely The Legend of Zelda and Animal Crossing. And it may be that I appreciate Luigi more than Mario himself. But I get the love for the 2D platforming bliss that Mario ground pounds and jumps his way through so much more now thanks to Super Mario Maker. There’s pride in all those little 8-bit enemies, heroes and mushrooms even as they translate into their more modern counterparts—the way they move, the way they can be directed, and the way in which they bring the Mario theater to life. It’s a pride that extends to creating worlds which has been an interactive wonder, where classic Mario music gets put through some warped arrangements and icons grow legs, eyes and become fearful at what you’re going to do with them. 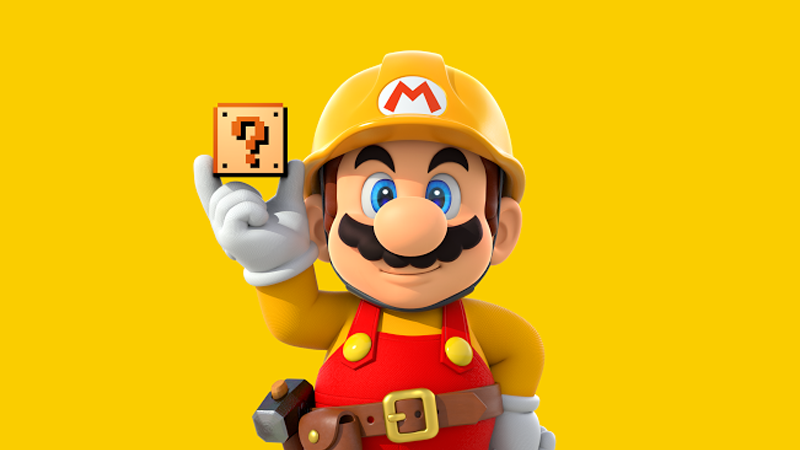 Super Mario Maker puts you in charge of your own imaginative fantasies by giving you a handle on Nintendo’s own. A lot of my new found appreciation for 2D Mario has been largely in part due to creating and playing the game, while seeing friends excitedly exchange boastful messages about how stupidly hard or idiotic their own courses are. There’s a sense of community, playful jabs and fierce competitive smack talk sprinkled in with just how much adoration they obviously feel for Mario. It’s all been a marvel, particularly getting to share in that excitement with my young nephew’s experiences with gaming. I get to glimpse into his creative mind—the end castle hidden behind crawling vines like seaweed, Lakitu’s clouds deep in the ocean. What’s been most fascinating has been observing his budding curiosities on how games work. He spends hours perfecting every little detail to make sure his levels have some measure of difficulty but are manageable as well, and his Mario takes all the play testing in stride. Tossed repeatedly into pits of lava, and always eager to do so with a “Let’s-a-Go!”, Mario is probably the most enthusiastic protagonist to face danger at the hands of millions of gamers, with my nephew included. Super Mario Maker now places his gaming experiences so far from my own, in which I am merely content to play whatever creation someone else provided me with. There’s nothing wrong with that at all, and I appreciate everything I’ve played. But here with Super Mario Maker, I’m learning just how important Mario was, is and continues to be in a long, expanding history. Even if playing the game solidifies that I’m still really awful at Mario platforming. Yes, even though I have the ability to edit things to make things a tad easier. And if nothing else, getting to Super Mario Maker’s save screen to catch a few seconds of Mario Paint’s “Save & Load Theme” with its thumping bass is enough to set off euphoria.